What were people back in Sychdyn doing whilst the troops were away fighting? Nov 25th 1914. This morning I received from Mrs Ivor Davies, 4 lbs of wool and 12 sets of needles from the Soughton Committee in order that the upper standard girls should knit scarves for the troops. Dec 22nd 1914 This morning I forwarded 15 scarves and 7 pairs of mittens to Mrs Ivor Davies, Bryn Siriol. Oct 21st 1915. All the children brought potatoes this morning. These are to be sent as a gift to the Leeswood Hall Hospital for wounded soldiers. Dec 7th 1915 I was away from 10 – 12.10 this morning visiting the Recruiting Office. Jan 10th 1916 Dear Sir, Please convey to the children our very grateful thanks for the 6 chairs which they have kindly sent for the use of the soldiers at the Leeswood Hall Hospital. Believe me, yours very sincerely, B Lloyd Parry . Quartermaster. March 21st 1916 The Attendance Officer called here this am. He informed me he was leaving to join the army. Nov 11th 1918 The children were given a holiday in the afternoon to celebrate the cessation of hostilities and signing of the armistice by Germany. June 30th 1919 The managers granted a half holiday today to celebrate the ‘Signing of Peace’. July 19th 1919 Peace celebrations took place today. The scholars from this school were entertained at Northop in conjunction with the Northop children. Nov 7th 1919 Today four German rifles were sent to the school from the Northop CE school. Dec 17th 1919 I received today a number of Peace Memorial Certificates from Mrs Helen Gladstone. Nov 11th 1920 The two minutes silence was observed today in commemoration of Armistice Day. Nov 11th 1924 The children paid a visit to the War Memorial and kept the two minutes silence after which a hymn was sung. ‘The programme was rather lengthy’ They must have been there till midnight! What is a ‘cholera belt’? Does anybody know? The next three photographs are probably pre -war but they were too intruiging to leave out. If anyone can help us explain any of them, please get in touch. They were provided by Jane Bradshaw who is a member of the Piercy family. What on earth this is about, we can’t begin to guess. What are the sashes about? Can anyone help? 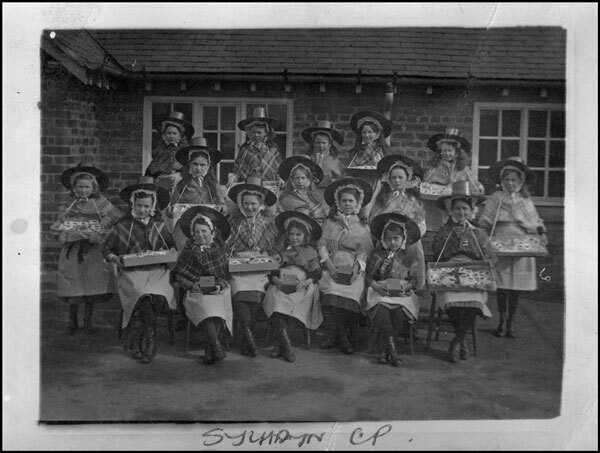 Again, Isabella Piercy is there, standing right of centre with a brooch at her throat and wearing a straw hat. She is holding baby Griffith who has a dark hat on. This would be circa 1898 and it is in Sychdyn. We think this must be the opening ceremony for the new Coop in Sychtyn (with a ‘T’). Gladys Jones whose mother was Jenny Piercy (sister to Griffith and William) kindly sent us this photograph from Canada. We were delighted to receive this wonderful photograph of P.C. Wasley who apprehended the apple pilferers in the news item above. Many thanks to Pauline Higgins, the great niece of P.C. Wasley who shared the photograph with us. What we need now, of course is some mug shots of the villains. Anyone? Who is this Mystery Major? This item wich appeared in the County Herald on 19th October 1917 is something of a mystery. Major Samuel seems to have been a remarkable soldier. He signed up at a recruitment meeting in Sychdyn Village Hall but we know nothing else at all about him. Can anyone help?